So, being in Delhi, and only 3ish hours from Agra (so said Google maps) and the Taj Mahal, and I figured that I had to go. A couple of people told me not to bother, but hey, its the Taj Mahal! I figured that if I could get there about noon, with really harsh light, all the better (there was heavy sarcasm in that last sentence by the way) I found 3 Scottish nationals (who were there for the Commonwealth Games) that wanted to go, so we rented a car and driver, and left at 6 in the morning. Well, that was a fun ride. First of all, the roads had been ripped up to put a “Metro” into Delhi, and one of the above ground lines heads out of town along the way to Agra, and the road underneath had not been put back together again yet. Slow going. We finally got out of Delhi, and hit a nightmare traffic jam. We were stopped short without moving for 1/2 hour. Turns out that Saturday was a holiday, and one in which many many people like to go to the Taj. Sigh. We were closer to 6 hours getting there. So, I got my wish of crazy harsh bright and overbearing light. It turns out that we picked up a guide in Agra that our driver hooked us up with. Every one has an angle to get paid in India. His is to take us on a tour and then tell us that he only gets paid by our tips. Nice. What it also meant was that I didn’t get to just wander. I was always running to catch up to the other 4. Oh well, I didn’t have great expectations of images from this place. After getting a couple of typical from a distance shots of the whole building, I put my 70-200 lens on and got pieces of the Taj, that I like a little better. Seemed the best choice. 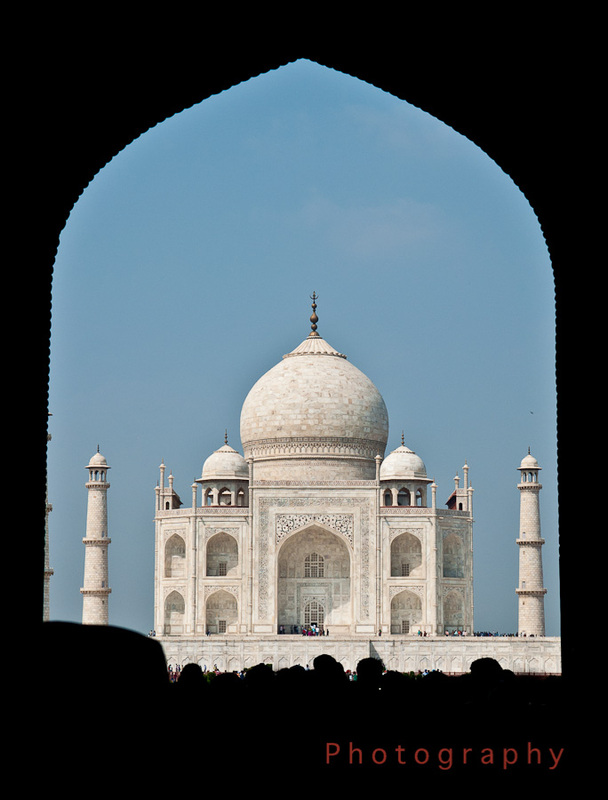 Actually, I like the shot at the top, where you see the Taj Mahal through a tunnel that goes all black and made a nice frame. It’s far from original, but I liked it still. I did take a couple of detail shots of the inlay in the marble. It’s hard to believe the work that was required to make the small pieces of precious gems that went into the outside, the inside, and everywhere that you see a surface. So, we kind of joked, that if didn’t go we would have always regretted going, but after going, not sure it was worth 6h there and 4h back. It meant a missed day of shooting in Delhi that I really liked, but hey, it’s the Taj Mahal!